Spam emails are annoying – there’s no denying it. Fortunately there are a few key techniques to reduce the overall amount that reaches your inbox. Spam can cost individuals and businesses a lot of time and money with tools and even dedicated systems to detect and filter them. While no filter is perfect, these large systems can correctly detect the majority of spam and are an essential function for preventing spam. It’s highly advised to enable any available spam filter or system. With NetHosted you’re automatically covered with our SOLAR Anti-Spam system, which automatically detects and quarantines any spam emails received. This is included with all our email and hosting plans by default. Don’t post your email address on public websites or forums as automated bots crawl the web 24/7 in search of email addresses. With your email address available publicly it’s almost certain that you’ll receive a larger number of spam emails, and it opens you up for a wider range of different types of spam. In addition, email addresses are also sold to other spammers resulting in even more spam. If a spam email contains HTML tracking opening it may alert the spammer that your email address is live and active, causing even more spam to be received. 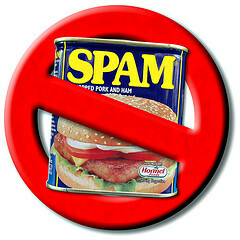 Spam emails have also been known to contain viruses so it’s advised to avoid opening or previewing them if possible. In addition to this, you should never reply to any spam emails or click links within them (even ones to unsubscribe) as this will notify them that you’re a valid recipient. If possible you should also report the spam email so your spam filter or system learns. Never use your main email address if you need to sign up with a site that looks suspicious, or if you don’t wish to receive any further emails. You can use an email address hosted on your domain or a disposable email. There are many providers which over these services such as 10minutemail.com or mailinator.com. Use a secure password to prevent hackers from brute forcing into your email account. Use a unique password on all email accounts to ensure they’re secure from hackers and brute force attacks. This should ideally be 10 characters minimum including uppercase, lowercase, numbers and symbols and not including any dictionary words to ensure this is very difficult to crack. By following these simple techniques you should certainly be able to reduce spam, if not get rid of it altogether. If you have an existing email address that is receiving a lot of spam then the easiest way to reduce this will be to use a good spam filter, we’ve had great feedback on our SOLAR Anti-Spam system which is in place on NetHosted. If you wish to try this out you then you can sign up for an account, we offer a 14 day money back guarantee so you can test this risk-free!